Every Saturday, I host a feature called Kid Konnection -- a regular weekend feature about anything related to children's books. 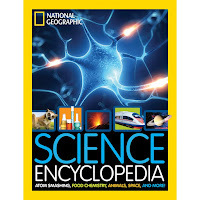 This week I'm going to share with you some more great books from National Geographic that are perfect for holiday gifts. Do you know a kid who loves science? Then I have the perfect books for this holiday season! National Geographic has published two big (and I mean big) books about science. 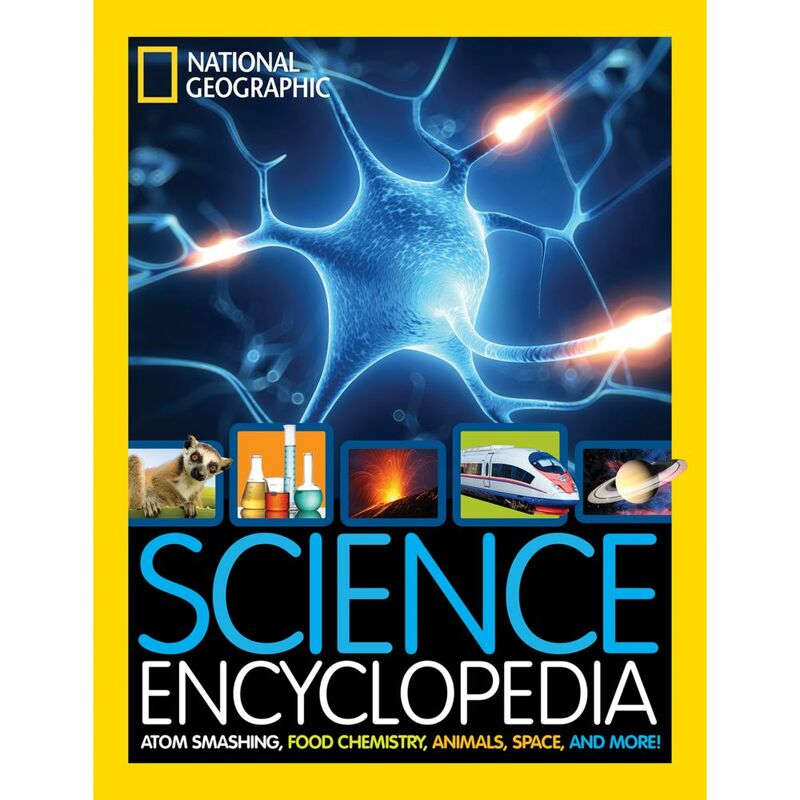 SCIENCE ENCYCLOPEDIA: ATOM SMASHING, FOOD CHEMISTRY, ANIMALS, SPACE, AND MORE! 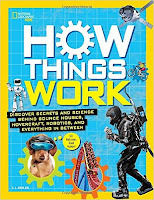 and HOW THINGS WORK: DISCOVER SECRETS AND SCIENCE BEHIND BOUNCE HOUSES, HOVERCRAFT, ROBOTICS, AND EVERYTHING IN BETWEEN are incredible reference books for those curious readers who want to learn more about the world around them! Words can't begin to express just how amazing the SCIENCE ENCYCLOPEDIA is! This book is coffee table gorgeous with all of the larger-than-life full color photographs that I've come to know and love from National Geographic. And that's even before the 300+ pages of information about a wide variety of science topics. This book is almost too good to be true for science enthusiasts. The SCIENCE ENCYCLOPEDIA isn't just for kids. It's geared towards kids ages 8 to 12, but I think there's plenty for adults to learn between the pages of this book. The book covers a wide variety of subjects and is divided into two parts -- Physical Science and Life Science. Those sections are then divided into chapters. Physical Science contains the following chapters: Matter, Forces and Machines, Energy and Electronics. Life Science has The Universe, Life on Earth, The Human Body, and Planet Earth. See what I mean about how much this book covers? SCIENCE ENCYCLOPEDIA is so appealing whether you read it from beginning to end or use it as a reference book. The information is presented is a fun and reader-friendly manner. There are lots of graphics and different types of text boxes to keep things interesting. And of course, the color photographs make the book even more appealing! Highly recommended for school and home libraries! HOW THINGS WORK by T.J. Resler is another educational, yet fun, book about science. I'm not exactly the ideal audience for this book because my brain just doesn't work like that, but this book will certainly appeal to kids ages 7 - 10 who are budding engineers. Truth be told, I actually found many pages in this book to be fascinating despite my reluctance to figure out how anything works! HOW THINGS WORK is actually a very cool book and covers quite a few interesting topics. The book is divided into the following chapters -- BEAM ME UP, HOME IS WHERE THE FRIDGE IS, SCHOOL OF COOL, EXTREME FUN, and HERE TO THERE. Those chapter names are a bit cryptic. Basically, the book teaches kids about various machines work. However, this book also offers much more than that. There are biographies of famous scientists, diagrams, illustrations, photographs and more! There are many things to like about HOW THINGS WORK, but one of my favorite parts was the section on how glue sticks. It answers some basic questions like, "What does it take to hold things together?, Why doesn't it get stuck inside it's bottle", and Why does glue dry up?" The chapter explains adhesion and cohesion and provides some interesting fun facts about glue! Overall, HOW THINGS WORK is definitely a fun way to learn about so many things we take for granted in our daily lives (or at least I take for granted)! 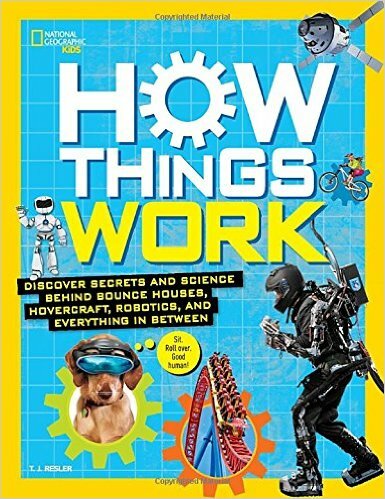 Definitely recommended for future scientists and engineers or anyone who is curious about "how things work." Thanks to the Media Masters for providing review copies of these books. Oh my gosh, these books are gorgeous! What a fun way to learn science. I wish we had these when I was growing up. I began to love science when I started exploring books like these with my son. Carl would probably still love How Things Work. Those books look marvelous! I know a kid who might love these! Thanks.